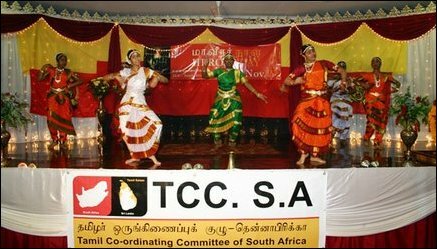 South African Tamils on Tuesday commemorated Tamileelam Heroes Day, paying homage to 19,887 war heroes and listening to Liberation Tigers of Tamileelam (LTTE) leader Velupillai Pirapaharan's speech at the Arudpaa Kazhakam in Durban. Pazha Nedumaran, the veteran Tamil National Movement leader from the Indian state of Tamil Nadu, addressing the community leaders, religious dignitaries and supporters of Tamil struggle, called on the Global Tamil Community, to rally behind the Tamil cause for the "dawn of Tamileelam as a free state" and Dasarath Chetty, Pro-Vice-Chancellor of the University of Kwazulu Natal, a South African Tamil of Indian origin, discussed the viability of Tamileelam. One of the two guest speakers at the event was the Pro-Vice-Chancellor of the University of Kwazulu Natal, Professor Dasarath Chetty, a South African Tamil of Indian origin. Jeeva Pather, a Tamil Co-ordinating Committee official hoisting the Tamileelam flag. Addressing the Heroes Day event, organized by The Tamil Coordinating Committee (TCC) and held at Arudpaa Kazhakam in Durban, Mr. Pazha Nedumaran told the audience that he witnessed the very first sacrifice of the LTTE, Lieutenant Sankar, who died 25-years ago, after being brought to Tamil Nadu for treatment from Jaffna. That the first Tiger to sacrifice himself exhaled his last breath in the soil of Tamil Nadu, on November 27, 1982, had a historic significance, he said. Speaking further, Nedumaran said: "First Tiger Hero Sankar embraced death in my hometown Madurai. He was injured severely in the battle and brought to Madurai and admitted in a hospital there. Though the doctors tried hard, they were unable to save his life. Tamil Eelam National Leader Pirapaharan, who was then staying in Madurai, was beside him in the hospital. 'Maaveeran' (Hero) Sankar embraced death lying on the lap of his beloved leader. On seeing his trusted friend die, the otherwise strong hearted Pirapaharan was shattered. On seeing him shedding tears for his comrade, I could not stop my tears." "Consequently, Pirapaharan declared to commemorate November 27th, the day on which Maaveeran Sankar died, as Heroes Day," he said. Nedumaran observed that the Liberation Tigers have revived the ancient custom followed by the people of Changkam period. In Ancient Tamil Nadu, there was a custom of erecting "Hero Stones" or "Nadu kal" and worshiping them, in remembrance of the warriors who sacrificed their life in the battlefield. There are a lot of citations for this custom in the ancient Changkam Literature and also in the inscriptions of that period, he said. Nedumaran stressed the necessity of a separate Tamil state and appealed to the audience to rally behind the Tamil cause. "We should never forget that the dawn of the Tamil nation relies on the dawn of Tamileelam as a state," the TNM leader said. Prof. Dasarath Chetty spoke about the destructive effects of conflict such as the one in Sri Lanka. He also discussed the viability of Eelam as a separate state and the way forward once this is achieved. "Peace is not just about stopping the war, it is about equality, it is about sharing, it is about social justice and human rights," he said. Video clips of LTTE leader Pirapaharan's address in Tamil were played and the English translation of the address was conveyed by Ratchi Rajagopal of the TCC. Krish Swamivel Dance Academy and Bharatha natyam graduates, Shivanthini and Tharsini Nagalingam, performed traditional dance. The Greenwood Park Temple Society and Paarathiyaar Thamizh Pa'l'li gave their renditions of Tamileelam liberation songs.